As outlined in yesterday’s market commentary the squeeze higher for the euro vs dollar duly occurred with the wide spread up bar, and the close of the day finishing marginally above both the 14 and 40 day moving averages but just failing to penetrate the 9 day. 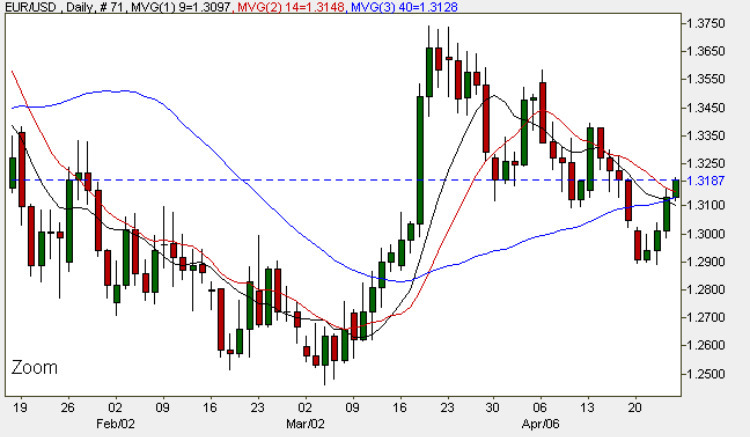 This momentum has continued in early trading this morning following the boost the pair was given by the German IFO figures which came in better than expected which helped the euro vs dollar clear the resistance level at 1.31 and at the same time moving through the day moving average. However, when this move is viewed against the context of the weekly chart this mild bullish momentum is simply that, and is hardly suggestive of a any strong move higher at present. For any sustained bullish momentum for the euro vs dollar we will need to see a break above 1.35 supported by all three moving averages. The fundamental news on the economic calendar which may impact both the euro and dollar are covered in more detail on the euro dollar site but notable news items include the release of durable goods orders, new home sales, and a speech by Treasury Secretary Geithner following the conclusion of the G7 meeting in Washington. In addition there is a tentative news item concerning the bank stress tests. My trading suggestion for today is to try and find small long positions 15 and 30 min charts with tight stop losses and taking any profits off the table as soon as possible.